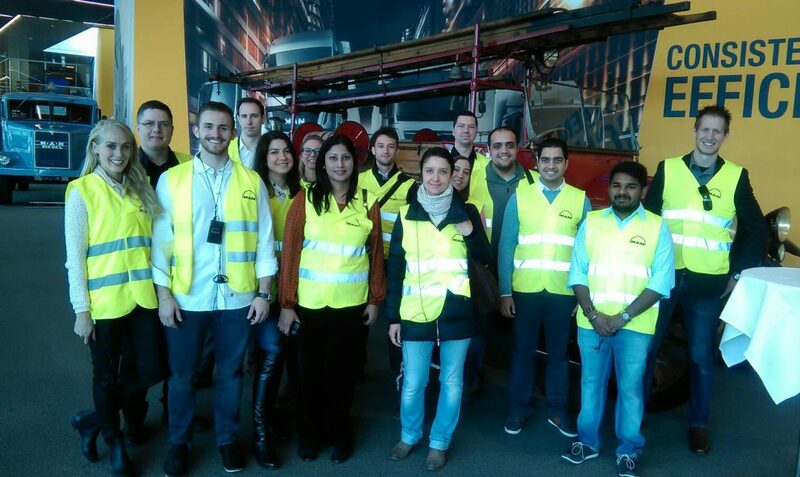 In the second on-campus week of the program, our Online MBA students arrived in frosty Munich for a week of socializing, extra-curricular activities and of course… exams. Click the play button in the main picture to see a video overview! Although it was icy underfoot, Bavaria was soaked in sun throughout the week, which made industrial trips to Lantenhammer Distillery and MAN Trucks all the more enjoyable. 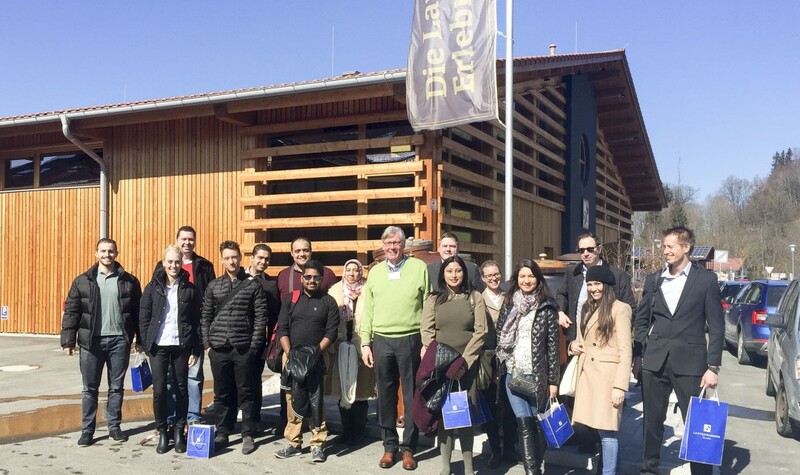 At Lantenhammer, students were able to see the production process of a wide variety of alcohols and the care and dedication of the experts in action. The management system of Lantenhammer is a hybrid family business, whereby family members have gone into the corporate world to gather a wealth of experience and different points of view, before dedicating themselves to the distillery. Lantenhammer is known for combining tradition with innovation; it relies on a lot of manual labor and small-batch production, but is the most technologically advanced distillery in Europe and second most advanced in the world. This method is paying off as Lantenhammer is going through a stage of rapid growth, profiting fromthe rising premium spirits market and avoiding the decline of mass-produced alcohol in Europe. MAN trucks is one of Europe’s leading commercial vehicle manufacturers with their headquarters in Munich. Aside from creating heavy trucks, MAN is renowned for its efforts toward sustainability. The company has been rated as one of the most sustainable companies in the world, according to the Dow Jones Sustainability World and Europe Indices. This significant jump from last year is testament to the company’s Corporate Responsibility Strategy. Sustainability and ethics are the pillars on which guest speaker Nicole Schillinger has built her career. Nicole is the Founder of Business Detox – a company which delivers keynote speeches, seminars and consulting on reputation, business ethics and sustainability. During her eye-opening session, Schillinger transmitted the idea that it is not only a moral duty to carry out business in an ethical way, but demonstrated through expert research that it is economically beneficial. Schillinger’s background in equity sales in companies such as Deutsche Bank, Commerzbank and Barclays have given her a vast amount of experience to work with, and she shares this experience through speeches, consulting and lecturing. As well as Schillinger, MBA students were treated to a discussion with Jens Bay (video interview coming soon), Industry Manager for Media and Entertainment at Google Germany. With a CV full of marketing experience, including working on a Grammy award-winning album, Bay is at the forefront of mobile marketing. He also discussed the effect of the working in the legendary Google offices and how the smallest details are considered in an effort to have a happy, healthy and enthusiastic workforce; indeed, Bay claims he becomes ill far more infrequently at Google than in other roles. It was not all hard work though. The week kicked off with a welcome drink on Monday which reflected the culture of the region; complete with pretzels, famous beers and Bavarian flair. 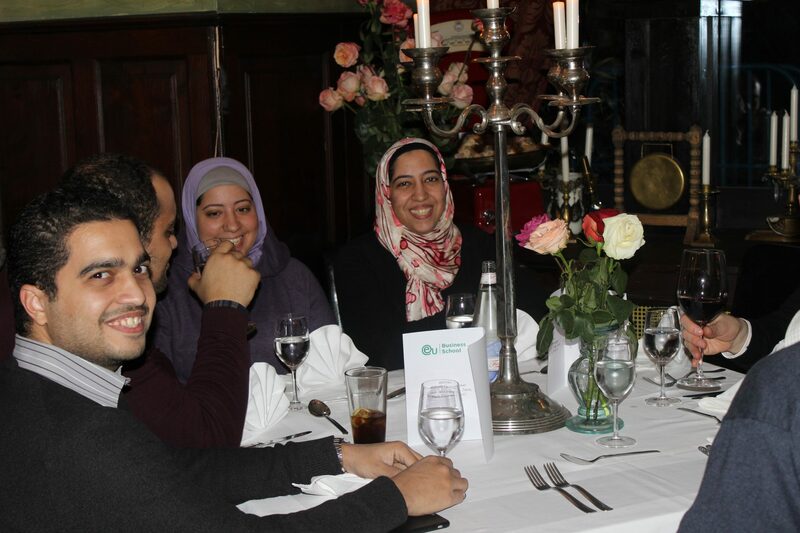 At the end of the week, students got together for a meal at the edgy Master’s Home restaurant in the center of Munich. The concept of the restaurant is that each room is themed on a room in a traditional house, with the library set up for studying, the living room ideal for chatting with friends and the bedroom had a relaxing vibe. The atmosphere was classy, with a pianist gently tinkling the ivories in the background and a very communal feel among the students. If this is any indication of how the 2016 series of on-campus weeks are going to go, our Online MBA students can look forward to an exciting year. Many thanks to the guest speakers and companies we visited; as well as welcoming team in Munich Campus and our Online MBA team who all worked together tirelessly to make the event the success that it was.